We had Office Cooking Club downtown at Big Blue. It was the first barbecue of the season! 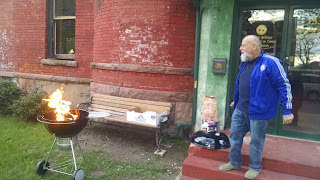 Above is my friend Melinda's husband, Mike, tending the grill on the front lawn. This is a club we have had going in various permutations over the years. In its current incarnation we have a handful of people from work, people interested in cooking, and we might have a celebrity guest, a person who has distinguished himself or herself in the culinary field. Last night the theme was Mexican. I made caramel ice cream! Here is the caramel under way. Isn't that wild? 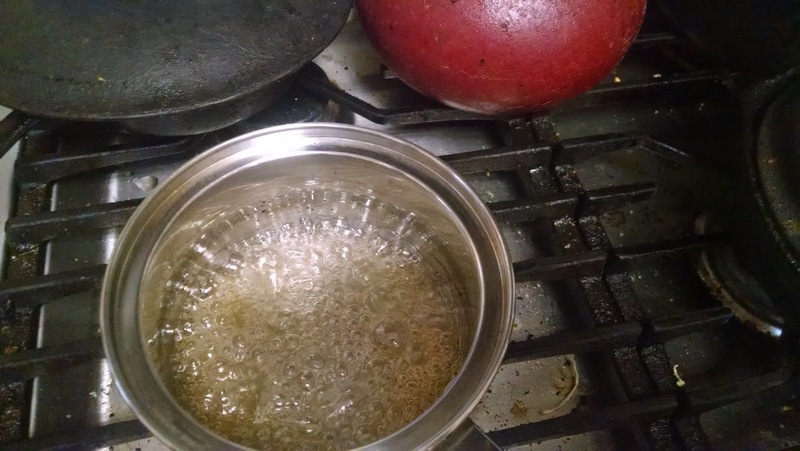 You had to heat up sugar and water and then let it boil. "I'll believe this when I see it," I said, out loud. But it worked! First you had to boil it unattended. That is something I have a problem doing. I always want to attend to things. You wait until it turns brown around the edges and then you stir it until it is a deep amber. All went according to plan! Then, zut alors, I realized the heavy cream in the fridge had gone south, despite the expiration date being still two weeks away. Forbid it, Almighty God! I had to run to the store and get more heavy cream. By the time I came back my caramel had hardened into this disc. That was all right! The Joy of Cooking said just to heat it gently and soften it. The Joy of Cooking's directions were not perfect and kept me guessing. But you know the slogan, stand facing the stove! That is what I did and the ice cream was a hit. It is fun to have cooking adventures! Which is what I did over the weekend. Friday it was our friend Dan's birthday, hence this cake. Which, I was proud of it! Thank you again, '80s Betty Crocker! 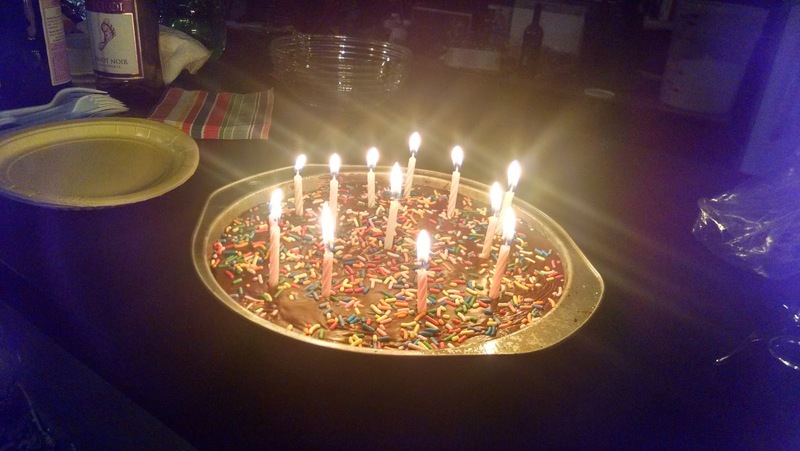 Plus, I love birthday sprinkles. And then came church coffee hour Sunday morning, and cooking club was Sunday night. Speaking of caramel and the Catholic Church, one thing that cracks me up is when people write "Carmel" instead of "caramel." It happens all the time! If you love it you are a Carmelite!